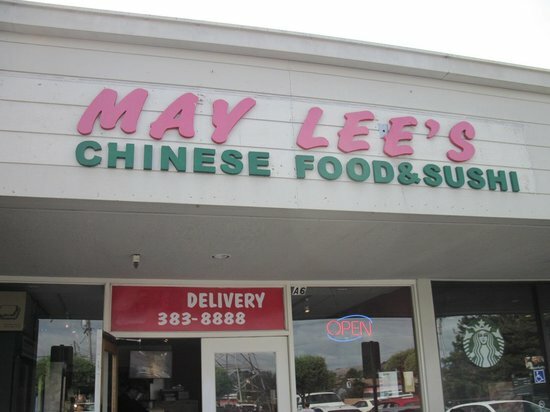 May Lee's, Californie n'a pas encore assez de notes sur ses plats, son service, son rapport qualité/prix ou son ambiance. Écrivez l'un des premiers avis ! No meat or shrimp, vegetable only. Chicken breast, shrimp, vegetable and wonton in chicken broth. Chicken breast, mushrooms, tofu and egg blossom. 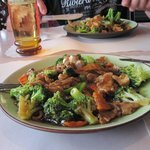 Chicken breast, shrimp and vegetables with deep fried rice crust in chicken broth. Chicken breast, shrimp, vegetables and egg drop in chicken broth. Assorted sea foods, tofu and vegetable in seafood broth. Stir-fried w. water chestnuts, onion, mushroom and garlic. Quick stir fried with scallions, chili, garlic, onions and soy. Chicken breast sauteed with zucchini and onion. Chicken Breast w. Mixed Veggies. Sauteed in light satay sauce. In chef's spicy special brown sauce. Quick stir fried with green onion, onion, garlic, chili and soy sauce. Sauteed in oyster sauce, black bean sauce, garlic sauce, hot black bean sauce, hot garlic. Sauteed‎ w. zucchini, onion and carrots in curry sauce. Sliced tender beef with cabbage, snow peas, carrots and bamboo shoots with red pepper, garlic and soy. Roasted pork slices sauteed with cabbage, mushroom, snow peas and carrots in tasty dark brown sauce. Sauteed w. Vegetable in hot spicy garlic sauce. Bean curd sauteed with spicy minced pork loin, mushroom in chili-garlic sauce. Sauteed‎ in light garlic sauce. Sauteed in a light garlic sauce. with a. Hot Garlic Sauce, b. Black Bean Sauce. c. Garlic Sauce. d. Hot Black Bean Sauce. 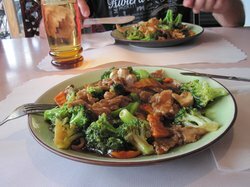 Sauteed broccoli, mushrooms, snow pea, bok choy, zucchini, cabbage and carrots in a light garlic sauce. Sauteed in Sichuan chili-garlic sauce. Snow peas, shiitake mushroom, tofu and carrot sauteed in spicy garlic sauce. Sauteed‎ vegetables in hot and sour, spicy garlic sauce. Fried tofu slice sauteed with string bean in a brown sauce. Tofu sauteed w. broccoli and carrots. Your choice of beef, chicken breast or veggie. Combination of the above meats and shrimp. Your choice of the above meats, shrimp or veggie. Your choice of the above meats, shrimp or vegetarian. Your choice of the above meats. 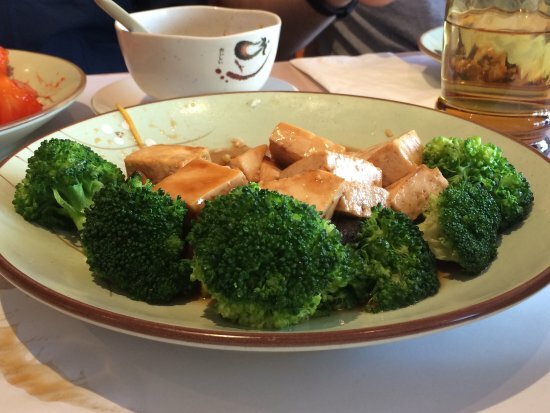 Your‎ choice of chicken breast or veggie-tofu. Semi crisp prawns with honey roasted walnuts in our special sweet cream sauce with a touch of lemon. Sliced chicken white meat, beef and shrimp quick stir-fried with scallions, ginger, garlic and soy sauce. String bean and sliced chicken breast meat quick stir-fried with chopped onion, garlic and chili pepper. Deep fried chicken nuggets sauteed in a sweet chili garlic sauce. Served with garlic broccoli. Eggplant, string bean, tofu, carrots and shiitake mushroom sauteed in spicy garlic. Sauteed with veggies in delicious satey sauce. Deep fried chicken breast meat in tangy lemon sauce. Deep‎ fried and tossed in a tangy chili garlic sauce. With‎ minced ginger, scallions, shiitake and bok choy. 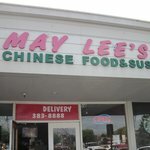 Obtenez des réponses rapides du personnel et personnes ayant visité le May Lee's.